I decided to visit the recently restored Conde Duque Cultural Center which gives title to its Neighborhood, bordered by c/Alberto Aguilera to the North, c/San Bernardo to the East, Gran Via to the South and Princesa to the West. I have previously visited this former military barracks of 1717, for the various summer evening concerts held in its courtyards. 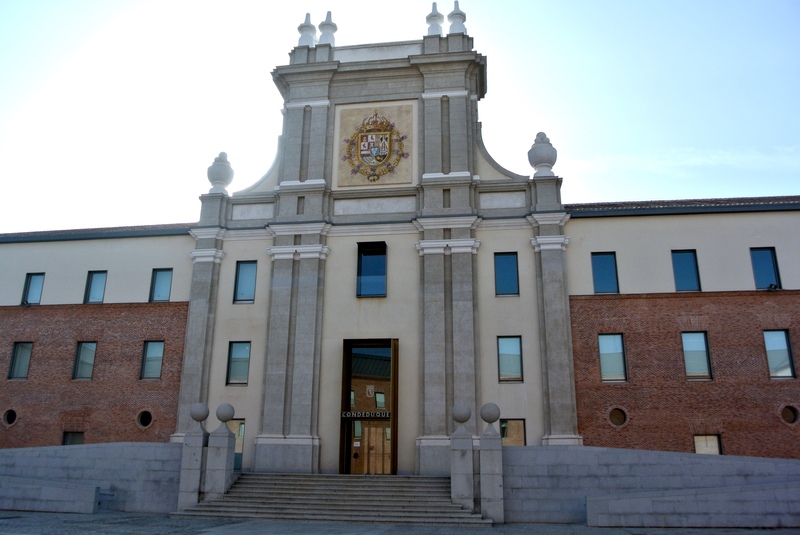 It has now been converted into a cultural center housing the Municipal Historical, Music and Film libraries, the City Archives and the Museum of Contemporary Art. The wing of the Museum of Contemporary Art, at the time of my visit, felt empty. There is a large staircase leading to the first floor where an auditorium and the permanent collection gallery are pushed to the sides of yet another commanding stair volume. It is elegant, yet the scale builds up to a disappointingly small gallery and collection. You would think that a city with so much art and rich curatorial tradition would have amassed and impressive amount of contemporary works. However, the newest permanent installation located on the second floor, is definitely worth the visit. The studio of writer, artist and collector Ramón Gómez de la Serna (1888-1963), has been carefully transported to this space. 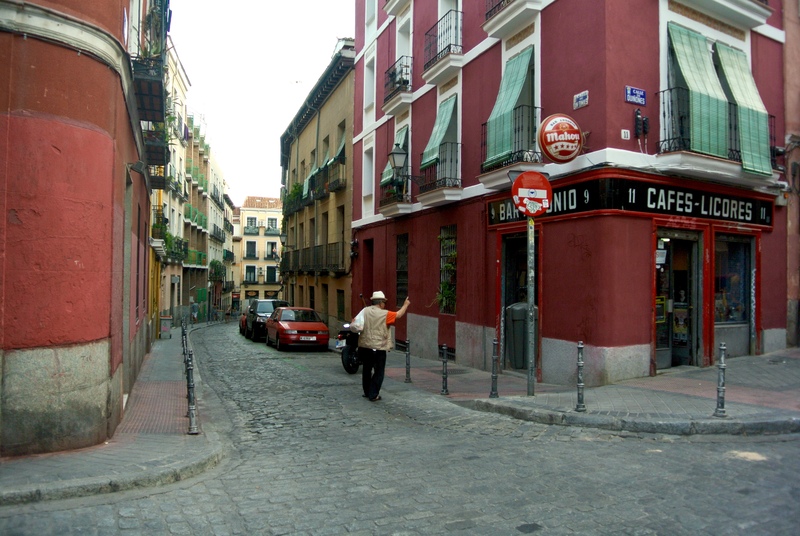 During his lifetime he had collected many curious objects from El Rastro, Madrid’s flea market, as well as his travels. 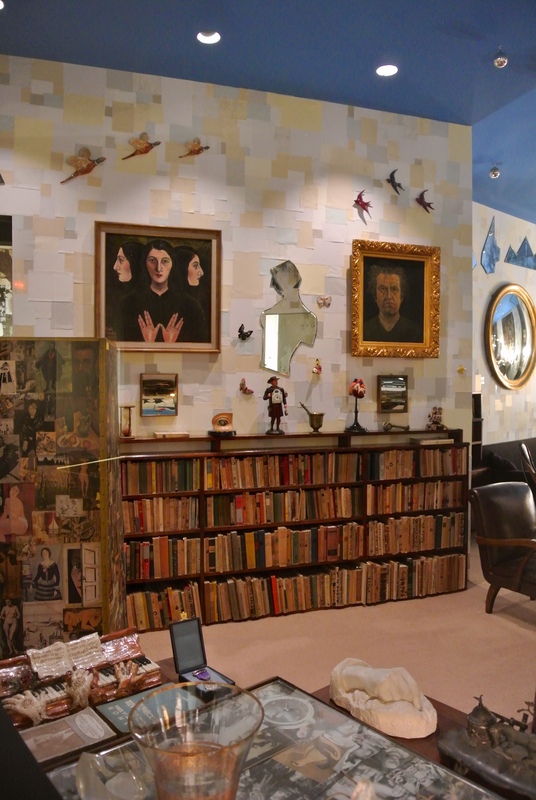 His walls, screens and every surface is completely covered by collages of clippings of everything that interested him, books, images, magazines, road signs, etc. He was a curious figure and the details and stories of his collection are well documented on some of his books. After leaving this space, I’m now inspired to read some of his books and gain more insight on this very influential avant-garde figure. After visiting the Conde Duque, I walked through the various narrow streets of this neighborhood that at times, its hills reminded me of Old San Juan. There are many artist studios and small shops, as well as new “hipster-like” specialty shops. Look for Olula-la, Sportivo, and FEEAS, a curious artisan who transforms objects into surreal accessories. Peseta is one of the pioneers in DIY handcrafted bags and accesories. 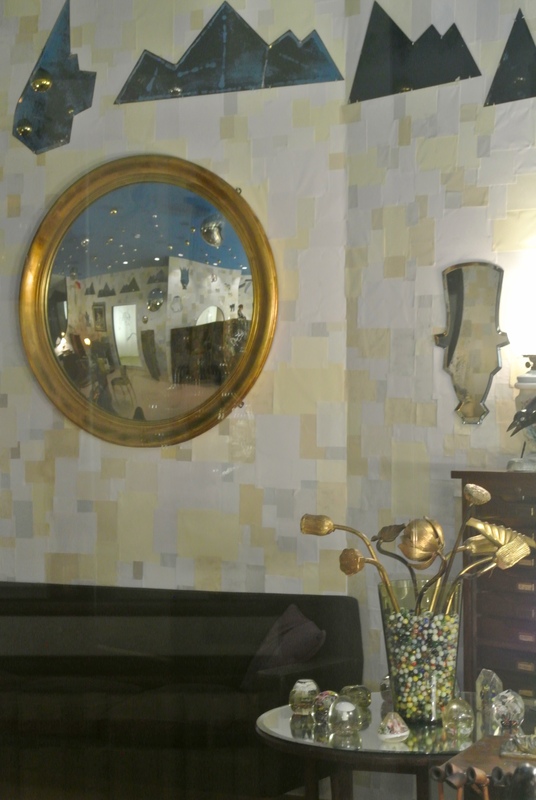 I came across a small workshop and vintage gallery that Gómez de la Serna would have loved. Estudio Albahaca, is populated by many papier mache figures created by owner/artist, Vicenta. She would love to sell more of her creations, but in the meantime she offers workshops for all ages on Wednesdays and Saturdays. Check her website for more detailed info on her offerings. My friend, Beatriz Gonzalez Mañero, who lives in this neighborhood, shared with me her local favorites. I have marked them all on my map for locating it easily. 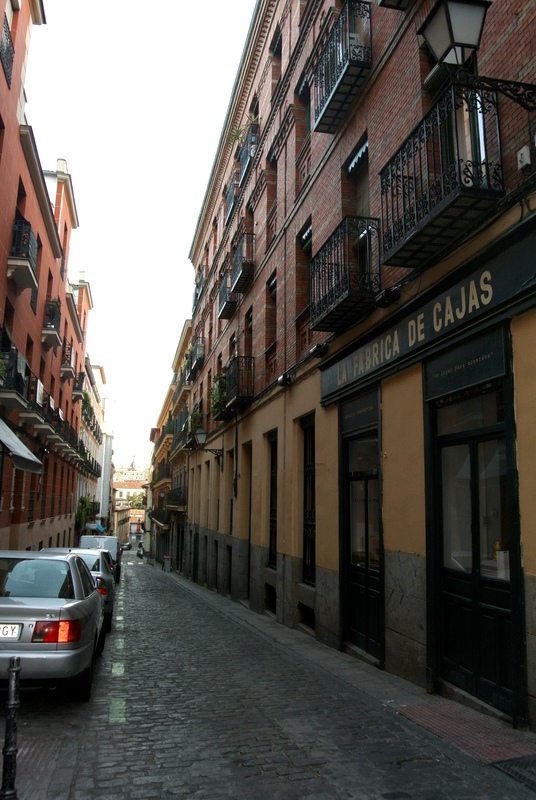 El Cangrejero: This typical bar of Madrid is considered by some as one of the best places where they draft the beer. The secret, says Beatriz, is in the “serpentina” or spout that is one of the original from the Mahou beer factory which was located nearby in what is now the ABC Museum. The factory workers would come here for their beer after work. Muuy is a unique shop, cafe, gallery that specializes in “preserves” of high quality foods. La Dichosa has a fantastic selection of wine and beers, a great tortilla de patatas and some meat pops. The owner, Eva and the waiter, Marcos will treat you very well. La Carbonera also offers great cheeses and beers. 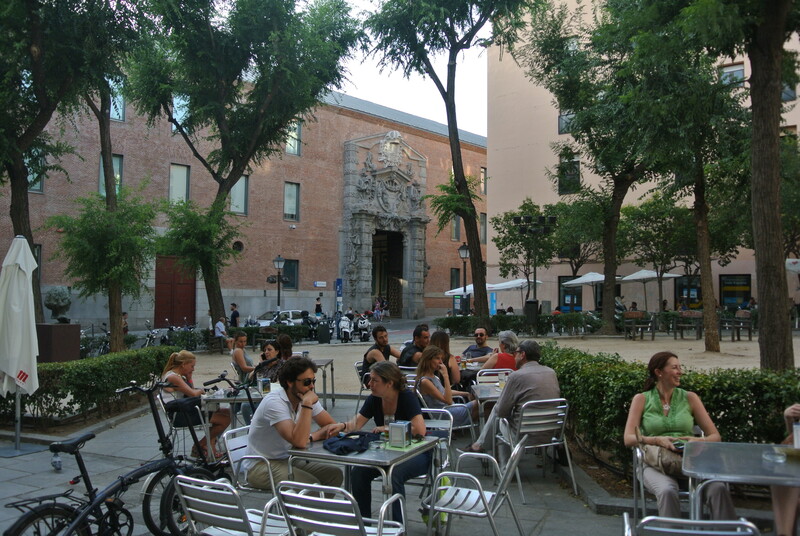 At the Plaza de las Comendadoras, you have the long standing Cafe Moderno and the Mexican, La Taqueria de Birra. Federal also has great coffee, chai and although when crowded the acoustics may be loud, it has a good hamburger. Olive has a terrace or outdoor sitting area and it’s known for its crepes. It shares the same owners of La Cajita de Noris. Panic is a new type of bakery, the artisan breads are amazing and you must go early before they sell out. The owner apparently offers some baking workshops. Next door, another specialty shop Queseria, Yogures offers just that but really good as they are in direct contact with their local source suppliers. Crumb has delicious sandwiches and make their own sourdough bread. Beatriz suggests the sardine or the chicken sandwich and to make reservations for weekends as it gets very busy. Muur is an english style cafe, located in the Plza de Cristino Matos great for cakes and pastries, go for their carrot cake. La Lata de Sardinas on c. Limón is another one you must call ahead. Apparently their gyozas are to die for. La Gloria is known for its salmorejo. For authentic asian food walk by c. San Bernadino and Plz. Conde de Toreno for Chinese, Thai and Indian restaurants.